Click here to find more real money casinos you can play at. The maximum cash out from this bonus is €80. Buran Casino went live in 2017. The online casino offers gaming services in multiple languages, including Portuguese, Russian, Polish, and English. Buran Casino operates on a software platform that supports play on mobile devices. Online and mobile players can play without having to download any software program or native gaming app. Buran Casino gives importance to customer care, security & privacy, and responsible gambling. Buran Casino is one of the online casino games on the Soft2Bet network. The online casino operates on an instant-play gaming platform that is based on HTML5 technology. Games written in HTML5 can adapt to any browser, device, and operating device. 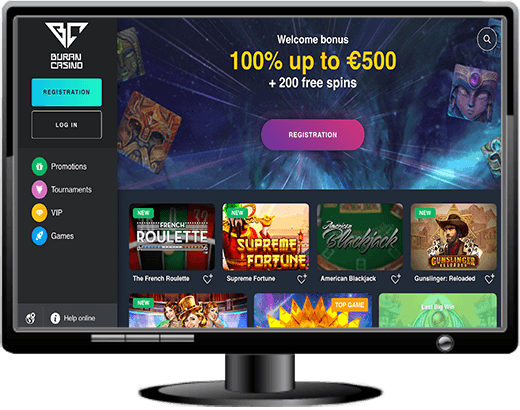 Moreover, Buran Casino's browser-based software platform enables the easy integration of online casino games from the numerous vendors, making it a multi-platform casino. Players have to click on the Games option in the main menu displayed on the left of the casino website to access the game portfolio. When they do so, the online casino will display its game library on their screen. Players can sort games according to filters such as top lists, new games, popular games, live casino games, slots, card games, roulette games, jackpot games, blackjack games, video poker games and poker games. They can click on the search symbol above the game library to find any game of their choice. PokiesMost of the games in Buran Casino's library are slots. Players can choose from 1000+ slots such as Lucky Wizard, Lion Dance, Treasure Mine, Scroll of Adventure, Princess Royal, and Robin of Sherwood. New GamesThe online casino continuously adds new games to its portfolio. Some of the newest games in the portfolio are Wild 888, Mystery Reels, Wins of Fortune, Viva Las Vegas, and Planet of the Apes. Video PokerPlayers can choose from 24 video poker games such as Pyramid Bonus Poker, Joker Poker, Multihand Bonus Poker, and Wild Texas. Card GamesPlayers can choose from 117 card games such as Casino Hold'em, Top Card Trumps, Ride'em Poker, Red Dog, and Baccarat. Live Dealer GamesThe library includes 15 live dealer games that can take the land-based gambling experience inside players' homes. Play live dealer games such as Live Caribbean Stud Poker, Fan Tan, Live Three Card Poker, Live Money Wheel, and Live Dragon Tiger. Roulette GamesChoose from 18 roulette variants such as Common Draw Roulette, American Roulette, European Roulette, and Roulette Crystal. Jackpot GamesBuran Casino's selection of 76 jackpot games can make players very rich indeed if they get lucky. Players can try their luck on games such as Ultimate Hot, Supreme Hot, 20 Diamonds, Summer Bliss, and Witches' Charm. Blackjack GamesBuran Casino offers 40 blackjack variants, including Blackjack Surrender, Live Blackjack, Blackjack French, Vegas Strip Blackjack, and Double Exposure Blackjack. PokerThe portfolio includes 19 poker variants such as Trey Poker, Casino Stud Poker, Five Draw Poker, and Let It Ride for players to choose from. The Buran Mobile Casino is fully optimised to work across multiple smartphone platforms. From iOS to Android and Windows OS, Buran Casino can be enjoyed by all. Furthermore, you can enjoy the same promotions, services and almost the as many games on the mobile casino as on the Buran Desktop Csino. Buran Casino is well-known for its ability to design promotions that can help players boost their bankrolls. Accordingly, players can always claim reload bonuses, weekly bonuses, weekend bonuses, and cashback offers at the online casino. Here is a brief overview of the regular promotions at the online casino. Weekly Reload Bonus Players can claim 50 free spins if they load €20 into their gaming accounts during the week. Weekend Reload BonusBuran Casino gives away 50% on players' weekend reload amounts plus 50 free spins. Players can claim the 50% match bonus by depositing at least €20. They can claim the 50 free spins as well by raising their deposit amount to €50. Loyalty PointsThe online casino rewards real money play on video slots with loyalty points that can later be redeemed for bonus credits. Whenever players wager €100 on the video slots, they will receive one loyalty point from the online casino. They can later exchange 100 loyalty points for one bonus credit. Weekly CashbackThe size of the cashback bonus that players can claim depends on the VIP level they have achieved. If they have achieved the highest VIP level, they qualify for the 15% weekly cashback bonus. Live Casino CashbackEvery week, the online casino gives away 10% on losses incurred while playing live dealer games. Super SundayBuran Casino runs lucrative tournaments on a regular basis. Players who participate in these tournaments stand the chance of winning some attractive cash prizes. Buran Casino offers customer support 24 hours per day and seven days per week through live chat, telephone, and email. The online casino’s support page includes a handful of Frequently Asked Questions (FAQ), which provide almost all the information new players need to get started. If players cannot find the information they are looking for in the FAQ, they can use the following methods to contact a customer support agent. Live Help: Players can instantly contact a customer support agent by clicking on the grey Help Online link at the bottom left of the casino website. The live chat window opens as soon as they do this. They have to then select a department from the dropdown box, enter their names and usernames, and input their message before clicking on the arrow symbol. This initiates chat with a customer support agent. Telephone: Buran Casino offers telephonic support on all days except Saturdays and Sundays. Players can call the online casino between 10:00 and 20:00 GMT+3. The telephone numbers are +356-2778-0669 for European players and 8 (800)-775-34-89 for Russian players. Email: Players can email their doubts, questions, and feedback to support@burancasino.com. They can rest assured of a quick and personalized response. Buran Casino supports play in Russian Ruble, Polish Zloty, Turkish Lira, Canadian Dollar, Hungarian Forint, Norwegian Krona, European Euro, Swedish Krona, Chinese Yuan, and Japanese Yen. Players can withdraw their winnings any time they wish. They can easily make a withdrawal from the casino cashier. The procedure is as simple as clicking on the Withdraw option, selecting a preferred withdrawal option, typing in the amount they would like to withdraw, and following the prompts that appear on their screen. Buran Casino processes all payout requests in 24 hours of receiving them. Before requesting payout, players have to play through their deposits 3x. If the online casino finds that the fund turnaround is lesser than the amount deposited, it will retain a commission of 10%. The time taken for the withdrawn amount to reach player accounts depends on the currency, country of residence, VIP level, and preferred withdrawal amount. The exact amount that players can withdraw per week depends on the VIP level they have achieved.